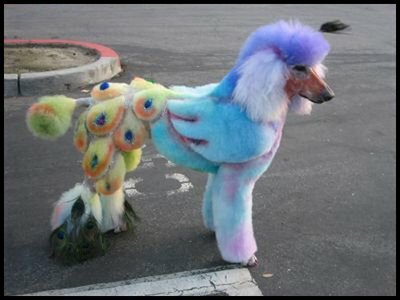 What do you guys think about creative grooming, meaning dogs that are dyed (with non-toxic dyes), or groomed to look like something else, such as a horse, turtle, etc (very popular to do with poodles). Do you think this is taking it a bit too far or is it all just for fun? It looks like it's just for fun. Poor doggie!!! It looks cool, but dont you think the dog knows that he looks DIFFERENT!!! I checked out some of the other cuts the this dog has had. The panda is really something. I wonder what it would cost? An arm and a leg perhaps?? lol, and maybe a kidney? Dog with wings? LOL! I think I would call that dog Dogasus. That's a really nice costume.